In case you are interested in seeing the large animals, then Akagera is right place to be. Found on the Rwanda Tanzania border, Akagera is consists of swamps, open grasslands, lakes, woodland and savannah. 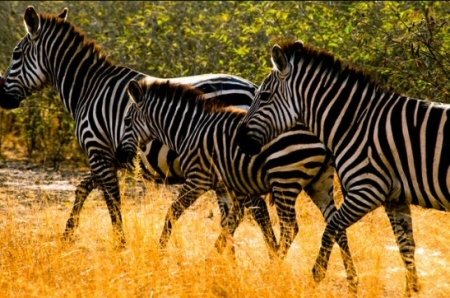 Numerous elephants plus buffaloes gather around the lakes while zebras plus giraffes are common in the savannah. The park is home to leopards, hyenas, lions plus over twelve antelope species. In addition, you will find crocodiles plus hippos close to the lakes. Among the bird species that make up the prolific birdlife here are the grand fish eagles plus great number of water birds. Within the swamps you will see the papyrus gonolek as well as the adored shoebill stork. Akagera National Park is situated in eastern Rwanda and the nearest city t the park is Kibungu which serves as the start point for safaris to this park. Akagera National Park covers an expanse of more than 2500 sq km west of River Kagera, which represent the border with Tanzania. This park is home to a diversity of wildlife and hosts more than 500 bird species. You will find accommodation facilities on the rim of the park just at Gabiro only 100 kilometers to the north. We recommend that you avoid visiting the park during the rainy months of April, December and March as most of the routes are impassable. “Akagera, having a complex blend of landscapes, vegetation as well as animals … is a very unique place on the planet, a place worth preserveing preserve no matter the costs for the future generations.” as stated by Jean Pierre Vande, in the conservation magazine Africa Environment and Wildlife. The park comes as a thrilling surprise right after steep well cultivated hills and the breezy climate which characterizes the remainder of the country. found at a somewhat low altitude on Rwanda’s border with Tanzania, this wonderful game reserve preserves a typical African savannah terrain of tangled acacia plus brachystegia bush, scattered with pieces of open grassland plus a couple of lakes surrounded by swamps which follow the winding River Akagera course. Akagera is, a big game haven as Herds of giant elephants and buffalos come from the woodland to the lakes to drink some water and actually lucky visitors can come across a spotted hyena, a leopard, or even a lion. Giraffes, zebras, antelopes like the chestnut-coated impalas, oribi, bushbucks, Cape elands as well as the tsessebe can all be seen in this park. Choosing to Camping alongside the beautiful Akagera lakes is certainly a mystical introduction to the beautiful wonders of this African bush. You will be fascinated by schools of hippos and giant crocodiles in addition to the various bird species here. Rwanda like its other East African counterparts has a lot to offer as a tourist destination. The Akagera national park is one of the many tourist attractions in the land of a thousand hills. The Akagera National Park is named after river Kagera/ Akagera which runs through the park. The park is made of open savannah plains, pleasant hills broad leafed-forests, candelabra euphoria trees, lakes teaming with crocodiles and an impressively large concentration of hippos. This park has very exquisite scenic views. 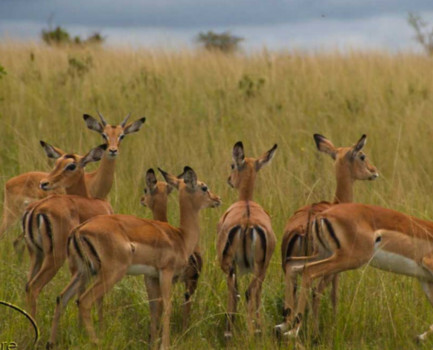 The wildlife in Akagera includes: elephants, buffaloes, zebras, burchel zebras, Masai giraffes various species of antelopes such as the defassa Waterbuck, Topi, roan antelopes, the large Eland Antelopes, Bohor Reedbuck, Oribi, Common Duiker, Klipspringer and the semi-aquatic Sitatunga Antelopes. 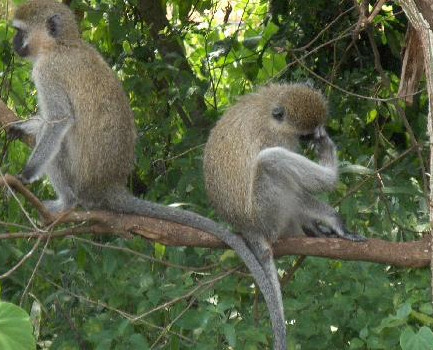 There are also some primates such as vervet monkeys, olive baboons, wide eyed bush babies and the rarely seen blue monkeys. A few other animals you might come across include: lions which are rarely seen, the black tailed mongoose, catlike genet, black-masked civet, serval cats, warthogs, bush pigs, rarely seen lions and more. For those interested in birding, Akagera national park has over 520 bird species. 100 of these species can only be seen in this park. Some of the birds in the park include: raptors, papyrus gonolek, shoebill stocks, migrant birds such as the lesser kestrel and the great snipe, a few Zambian home species such as the suaza shrike, arnot chat and the long tailed cistola. 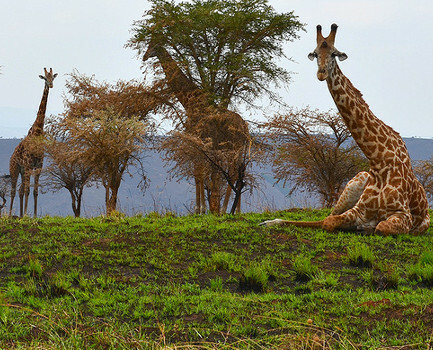 What are some of the interesting things to do on a visit to Akagera national park? Game drives: game drives are always exciting and full of surprises. You get to see various animals in the park and as many photos as you possibly could. In Akagera you will get to see lions, antelopes of various kinds, buffaloes, elephants, monkeys, baboons and so much more. 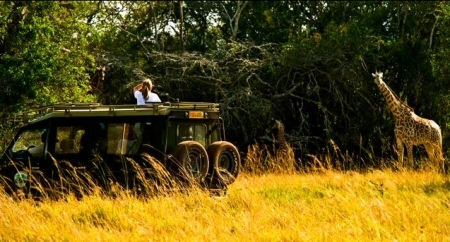 For game drives you will be accompanied by a guide who is very knowledgeable about the park and the wildlife in the park. These guides are a source of information for you. Guided nature walks: a nature walk is an opportunity to see various aspects of the park up close. With the help of a guide you can take a nature walk through the forest, and follow the trails in the park, and learn more about the flora and fauna in Akagera. It can be interesting, refreshing and educational. Nocturnal game drives: Akagera national park is one of the few national parks where you can go on a game drive at night. Using spotlights to see animals in the night can be surreal and exciting. Some of the animals that are hard to see during the day, the predators especially come out at night and can be seen on a nocturnal game drive. Leopards, hyenas, civets, and bush babies are some of the animals you might see at night in Akagera. You might also see some nocturnal birds. Bird watching: there is such a wide a variety of birds in Akagera national park. With over 520 bird species, this is the perfect safari destination for the avid bird watcher. Birds in the park include the rare and threatened papyrus gonolek, the elusive shoebill stork, and many more. Fishing: you can also go fishing for tilapia and catfish on your visit to Akagera national park. Fishing is done along the shores of Lake Shakani and it is still an experience of the African wild. As you fish along the lake shores you will hear hippo snorts, and water bird cries and so many other sounds that are a clearly sounds of the wilderness around you. You can also participate in a fishing tournament is there is one going on at the time of your visit. If you participate in the tournament and have good angling skill, you get to keep, cook and eat your fish! Boating: boating safaris are one thing that never gets old. They are simply exciting. In Akagera national park you can go for a boating safari on Lake Ihema. Lake Ihema has one of the largest concentrations of hippos in the region and has numerous crocodiles as well. You could also see some elephants as they make their way to the water to have a drink, and to bathe. You will also see various water birds while on a boat safari on the lake Ihema. Akagera national park is one of Rwanda’s best national park is well worth a visit and should be added to your safari itinerary as you plan to visit Rwanda, whether it is a trip to just the one country, or an combined east Africa safari, or just a gorilla trekking trip. Take time off and visit this Akagera national park.